Another computer in the same mold as the Osborne is this IBM portable computer, equipped with 640K RAM, two double-sided 5 1/4" drives, and an amber monochrome monitor. Long ago, when I used to work for Control Data, there was a similar IBM sitting abandoned in the corner of my office. Instead of exposing the drives on the front of the unit, this computer had a button you pushed that popped them up out of the top of the case. The drives were hinged at the back, so just the front popped up. After inserting a disk, you could push them back into the case and keep working. I'm still not sure if that design was cool, or just silly. 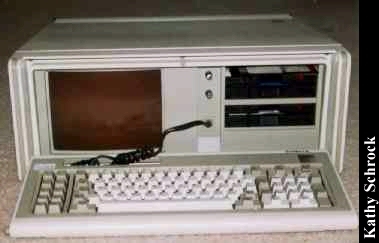 Other quasi-portable computers include the Kaypro II, the Osborne 1, and the Commodore Executive 64 (SX-64). Click here to view all comments for the IBM 5155 Personal Portable Computer and to leave your own.